We had an unusual PC problem here at Dave’s Computers last week. A customer brought in a Windows 10 computer that would not search. The customer didn’t use Cortana and instead used Taskbar Search to find things. Suddenly the search function stopped working and they couldn’t figure out why. That’s why they came to us. Search is one of those functions you tend to take for granted on any computer until it stops working. It is always there and seemingly always ready to find what you’re looking for. Until it isn’t. To fix Windows 10 Taskbar Search, you have three options. The first checks the Cortana process. Even though you may not use the digital assistant, it is integrated into search and it will not work unless the Cortana process is running. The second will reset the Windows Search process which is linked to Cortana. Finally, we’ll troubleshoot Windows Search and Indexing. Right click on an empty part of the Windows Taskbar and select Task Manager. Locate the Cortana process in Task Manager and click End task. Wait for it to reappear in Task Manager. You can restart the process if you prefer but Cortana automatically restarts so you don’t have to. Open Task Manager again if you closed it. Select the Services tab at the top and select ‘Open Services’ at the bottom. Locate the Windows Search service and make sure it is running and set to Automatic. If the service was stopped, start it and retest search. Windows Search and Cortana work together to deliver search functions in Windows 10. If one or either of these services isn’t working properly, neither will search. If that didn’t work, you could always try the Search Troubleshooter. I tend not to use Windows Troubleshooters as they tend to not be very good. Search is one exception where the troubleshooting tool can actually be of use. Open the Windows 10 Control Panel. Select All Control Panel Items to see all your options. Select Troubleshooting and System and Security. Select Search and Indexing and Next. Follow the instructions within the tool. One step the troubleshooter takes is to reset Windows 10 indexing which can go wrong sometimes. It may take a little while and the screen may appear as if it is doing nothing but be patient and it will finish eventually. 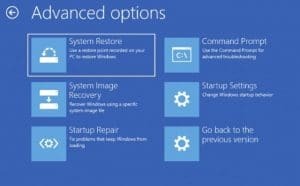 If you need help with Windows 10 Taskbar Search or anything to do with computers, the guys here at Dave’s Computers can help. Contact us to see what we can do for you! Previous Post: « What is port scanning and what can you do to protect yourself from it?